Washington, D.C., Apr. 12 � Thousands of members of the Iranian Diaspora across the United States are expected to convene at Washington's Constitution Hall to voice support for a democratic, secular republic in Iran, organisers said. The political convention will be held with the support of leading American and international figures calling for a firm policy against the theocratic regime in Iran, according to organisers. Members of the United States Congress, former U.S. government officials and parliamentarians from Europe and Canada are expected to address the half-day convention. According to a general press release, issued by the convention�s organisers, �The platform of the convention includes positions to address the Tehran regime's human rights abuses, support for terrorism and nuclear weapons program�. 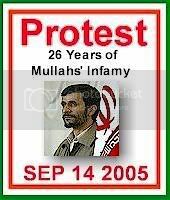 The event is called the �2005 National Convention for a Democratic, Secular Republic in Iran�, and is set to take place on April 14. The website of the organising committee is www.2005nationalconvention.org . The Sun Is Rising In The West! Soon It Will Shine on All of Iran! "Iranian Diaspora" should be replaced with MKO's (Mojahedins) since this is clearly an event organized by them. They have a right to voice support for republicanism however ultimately it will be the people of Iran who decide what type of system they deem beneficial for their country - Constitutional Monarchy or Republic. is that the old national anthem? I've noticed IranFocus seems to be MKO focused, not that there's anything wrong with that. when I open the page at the link I left some midi tune plays. is that it? I don't recognize it, it's not "Ey Iran" tho. Many links to "Ey Iran" around in here. I had thought they were more in the secular extreme left, the platform of that meeting seems ultra-secular. Didn't the National Council, the umbrella organization, actually merge with the Tudeh, Mossadegh's former group? Human Rights: Tehran must be confronted publicly and privately for its violations of human rights. Speakers on this platform will address the need for direct and persistent condemnation of human rights, gender apartheid, and violence against religious minorities in Iran. Terrorism: Tehran continues to support terrorist groups and undermine the stability in Iraq through its extensive network with extremists groups in the region. Speakers on this platform will present strategies to deter future acts of terrorism sponsored by Tehran. 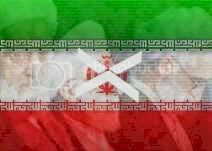 Nuclear Threat: Tehran is defiantly pursuing its nuclear program with an aggressive timetable. With various options are on the table, Tehran also senses indecision and disunity in the West. Speakers on this platform will offer a roadmap for a cohesive approach on Tehran�s nuclear threat. US Policy: No one in Washington can claim that appeasement and a foreign war represent viable policy options on Iran. Speakers on this platform will present a third option, which is to support democratic change by the Iranian people. "We stand for freedom. That is our conviction for ourselves; that is our only commitment to others." "The right of freedom and the responsibility to exercise of that right cannot be divorced." "The will of the people is the only legitimate foundation of any government, and to protect its free expression should be our first object." "Liberty, when it begins to take root, is a plant of rapid growth." " I have come here today to say that there is a third option: Change brought about by the Iranian people and the Iranian Resistance". � 2005NATIONALCONVENTION.ORG. All rights Reserved. 10. Minimum standard of life for all citizens of Iran and equal opportunity for all citizens to benefit from country�s national wealth. Out of the above categories the IOTM and S.O.S. Iran have shown one of the best records of performance as a democratic organization not ruled by one person. They do not promote only one person, important decisions are made through team effort, and currently they are becoming one of the fastest growing organizations despite the fact that they have very limited resources and are younger than other Iranian groups and organizations. Why is SOS Iran successful? One reason is because the structure of SOS Iran�s organization is democratic and fair. If the other 5 categories follow the IOTM and S.O.S. Iran model, then in a short period of time we will create a critical mass and get closer to the FREE IRAN Inflection Point. Now with the above introduction, I am suggesting if Empress Farah Pahlavi, Prince Reza Pahlavi, Prince Ali-Reza Pahlavi, Princess Farahnaz Pahlavi agree, they might consider creating an Iranian Royal Family Council with each selecting two independent advisers from other opposition Iranian groups as counsel and members of the Royal Family Council. Together they can define the Council�s responsibilities, conduct fundraising activities and engage in important decision making for freeing our homeland. In order to create more unity and a powerful network among the Iranian Groups, the royal family members also should consider accepting advisory positions in other groups. This will not only provide the royal family with a vehicle for greater participation, but also provide the opposition with a means of greater collaboration with the royal family in order to increase unity and collaboration across the board. I think Empress Farah Pahlavi should be considered as the head of the Royal Family Council. If the Royal Family Council is formed and respected advisers are selected, then I am sure that many ActivistChat members and groups would welcome active participation of all the top royal family members and independent advisers. Due to the fact that the majority of Iranian people live in California it might be better if the Royal Family Council consider opening their offices in Southern California until Iran is freed. Maryam Rajavi is not called president elect. they're suggesting they are the government. I think these people will say anything (secularism, democracy, etc.) to get what they want. Washington, D.C., Apr. 14 - Iranians from across the United States gathered in the Constitution Hall here today to take part in what they called Iranian-American National Convention for Democratic Change in Iran. Congressman Bob Filner (D-CA), joint-chair of the Iran Human Rights and Democracy Caucus of the U.S. House of Representative; Congressman Tom Tancredo (R-CO), a member of the Foreign Affairs Committee in Congress and Co-chair of the Caucus; Congressman Dennis Moore (D-KS); and Congressman Ted Poe (R-TX) were among the speakers who offered their support to the Iranian people’s efforts to topple the clerical regime and replace it with a secular, democratic government. The crowd gave rapturous applause to words of support from Republican Senators Kay Hutchinson from Texas and James Talent from Missouri. A number of former government officials, human rights activists, and parliamentarians from other countries also spoke at this convention. They included Dr. Neil Livingstone, a Washington-based terrorism expert and author; Prof. Donna Hughes, Chair of Women's Studies at the University of Rhode Island, and Paul Enzinna, a lawyer from former Secretary of State James Baker’s law firm, Baker Botts. Two former officers of the U.S. Army, Col. Kenneth Cantwell and Army lawyer Captain Vivian Gembara, both of whom served year-long tours of duty in Iraq, addressed the convention, as did Rep. Paul Forseth from the Canadian Parliament. Speaker after speaker called on the U.S. government to remove the People’s Mojahedin of Iran (PMOI), the main Iranian opposition group, from the State Department’s list of Foreign Terrorist Organisations. Several speakers said the terror tag was a key impediment to change in Iran at a time when the country is ripe for such change. Iranian opposition leader Maryam Rajavi addressed the convention via live video link from her home north of Paris. She urged all Iranians from different religions and political tendencies to “come together in greater unity for the sake of bringing about democratic change in Iran”. Delegates representing Iranian communities in 40 states across the U.S., including California, Colorado, Texas, New York, New Jersey, Kansas, Missouri, Georgia, Florida, Michigan, Pennsylvania and Ohio, declared their support for Rajavi’s rejection of “appeasement or war” as policy options for dealing with Iran, saying that “the only way to bring about democratic change in Iran is to support the efforts of the Iranian people and their resistance”. The State Department designated the PMOI as a terrorist organisation in 1997 in what Clinton administration officials said was part of efforts to thaw relations with Tehran. Agree, as long as Maryam Rajavi is promoting self centered position and assume there is no other choice except MKO , they can not work with other opposition outside Iran. It seems still they are focusing to get to power instead of freeing homeland and help to create a secular democracy. Contact: Hamid Dara of the 2005 National Convention for a Democratic, Secular Republic in Iran, 202-489-8982, media@2005nationalconvention.org . WASHINGTON - On Thursday, April 14, state delegations of Iranian-Americans across the U.S. held their 2005 National Convention for a Democratic, Secular Republic in Iran, declaring their resounding support for democratic change in Iran, in Washington's Constitution Hall. In its U.S. policy platform, the Convention called for "third option" in policy toward Tehran, first introduced by Mrs. Maryam Rajavi, the president-elect of the National Council of Resistance of Iran, in her address to the European parliament last December. The policy option, "No to Appeasement, No to War, Yes to democratic change by the Iranian people and the Resistance", received strong support for from a wide range of Congressional speakers, policy experts, former U.S. government officials at the Convention. Addressing the convention via live video link from her residence north of Paris, Rajavi urged all Iranians from different religions and political tendencies to "come together in greater unity for the sake of bringing about democratic change in Iran". U.S. Rep. Bob Filner (D-Calif.), co-chair of the Iran Human Rights and Democracy Caucus of the U.S. House of Representative; U.S. Rep. Tom Tancredo (R-Colo.), a member of the House International Relations Committee and Co-chair of the Caucus; U.S. Rep. Dennis Moore (D-Kansas); and U.S. Rep. Ted Poe (R- Texas) were among the speakers who offered their support to the Iranian people's efforts to topple the clerical regime and replace it with a secular, democratic government. The crowd gave thunderous applause to words of support by Republican Senators Kay Bailey Hutchinson from Texas and James Talent from Missouri. Several former government officials, human rights activists and parliamentarians from other countries also spoke at this convention. They included Dr. Neil Livingstone, a renowned terrorism expert and author and Prof. Donna Hughes, Chair of Women's Studies at the University of Rhode Island. Lt. Col. Kenneth Cantwell and Army lawyer Captain Vivian Gembara, two former officers of the U.S. Army who served year- long tours of duty in Iraq, addressed the convention, as did Rep. Paul Forseth from the Canadian Parliament. Speakers called on the U.S. government to remove the People's Mojahedin of Iran (PMOI), the main Iranian opposition group, from the State Department's list of Foreign Terrorist Organizations. Several speakers said the terror tag was a key impediment to change in Iran at a time when the country is ripe for such change. WASHINGTON -- Three hundred supporters of an Iranian opposition group characterized by the State Department as a terrorist organization gathered here yesterday to pressure the Bush administration to lift the designation. Supporters of the Mujahedin e-Khalq, or MEK, gathered just four blocks from the White House at Constitution Hall, where a handful of congressmen and two former military officers praised the group as the vanguard of a democratic opposition to the reigning mullahs in Iran. Lieutenant Colonel Thomas Cantwell, the former military police commandant of Camp Ashraf, a facility in northern Iraq where some 4,000 fighters associated with the MEK are under military supervision, expressed solidarity with fighters he used to guard. To cheers of support, he told the audience, "If there is a terrorist group in Ashraf, where are the terrorists?" After his speech, the colonel told reporters that, in his interactions, he believed the MEK fighters were sincere in their pledge to cooperate with American soldiers after they voluntarily disarmed in 2003. "Our assessment was that the Mujahadin represented a minimal threat to U.S. forces. There were no incidents of violence. They complied with everything we told them to do," he said. The MEK and its political arm, known as the National Council of the Resistance in Iran, are considered terrorists by the State Department for their role in a string of successful attacks on Iranian regime targets in the country throughout the 1990s. The organization, which initially supported the Islamic revolution in 1979, was purged by Ayatollah Khomeini in the early 1980s. With many of its leaders in prison, the MEK sided with Saddam Hussein in the Iran-Iraq war by 1985. In 1991, MEK fighters were on the front lines of Saddam's brutal counterinsurgency campaigns in the Shiite south and Kurdish north. "Up until the fall of the regime, they were part and parcel of the Iraqi military. And they were heavily involved in suppressing the Kurdish uprising of 1991," the Patriotic Union of Kurdistan representative in Washington, Qubad Talabani, said yesterday. Nonetheless, before the Gulf War, the group reached out to America and shared intelligence on a clandestine Iranian nuclear centrifuge program in Natanz. President Bush this year acknowledged that the first bit of information on the Iranian program came from the group. During Operation Iraqi Freedom, American special forces initially encountered MEK military units equipped with tanks, artillery, and armored personnel carriers. According to reserve Army Captain Vivian Gembara, the military lawyer who negotiated the deal for the MEK fighters to hand over their arms in 2003, the MEK was highly disciplined and knowledgeable about military affairs. "We have more reason to trust them than some of the other groups we worked with," Captain Gembara said. Specifically, she said she was mystified as to why coalition forces allowed the militia trained by Iran's revolutionary guard, known as the Badr Brigade, to remain intact while dismantling the MEK fighting unit. "We let the Badr Brigade keep their uniforms, but we disarmed people willing to work with us," she said. Yesterday's event, which the organizers called a national convention, featured groups of regional supporters of the MEK, who were in the audience and identified with the vertical placards of state names normally associated with political conventions. The similarities ended, though, when a message from an MEK leader, Maryam Rajavi, was beamed to an audience that shrieked and applauded with rapturous fervor. "Just as the time has come to abandon the appeasement of tyrants, so the time has come to remove the ominous legacy of that policy, namely the terror label against the Iranian resistance," Ms. Rajavi said to thunderous cheers. In 2003, members of the MEK immolated themselves in protest when French police briefly arrested Ms. Rajavi in Paris. Some congressmen shared Ms. Rajavi's position on the terrorist designation. Rep. Tom Tancredo, a Republican of Colorado, compared those gathered yesterday to America's Founding Fathers. Not all members of the Iranian opposition, however, have such fond words for the MEK. The organization has been left out of the nascent movement inside the country to press for a constitutional referendum. An Iranian activist in Los Angeles, Roxanne Ganji, told The New York Sun yesterday, "They are definitely a cult, and that is a dangerous thing. If anyone goes to Iran and takes the pulse of the people, though, 90% would never allow them to go back. That does not mean the information they gave America was not good. But they are a terrorist organization. If the United States wants information, then they can get it from viable groups and not terrorists."